Goodwin Funeral Home is an independent family-owned and operated funeral home, serving families in the Clinton County area since 1856. 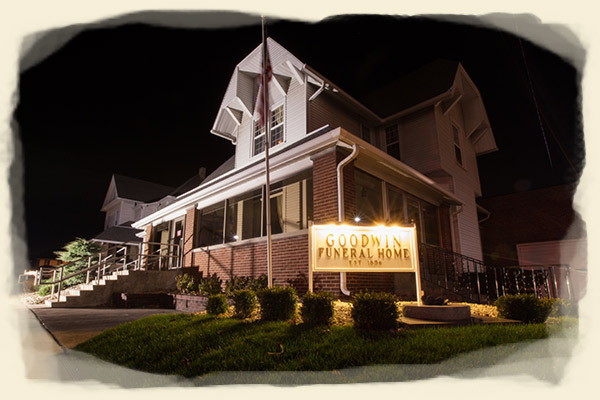 Goodwin Funeral Home responds to your needs at your convenience, any hour of the day or night. Our professionally trained, licensed and experienced Associates provide traditional and custom funeral services with reliability, competence and compassion. All unique requests are handled with respect. Families find our professionally decorated, home-like interior warm and inviting.We can amply accommodate large gatherings. There’s even a family lounge for refreshments or private conversation. Our mission is to serve a family’s needs as we would want to be served. At the time of his death in May of 1996, Bill Goodwin was the oldest active funeral director in the state of Indiana. A lifelong Frankfort resident and funeral director since 1927, his love of the community extended beyond civic activities to youth sports, tennis, and antique automobiles. Bill graduated from Frankfort High School in 1922, University of Illinois in 1926, and mortuary school in Indianapolis. W.H. Goodwin was associated with the Goodwin Undertaking firm from 1885 until his death in 1919. He received his early education in the Frankfort City Schools and later attended DePauw University in Greecastle, IN. He was a graduate of Clark’s School of Embalming in Cincinnati, OH. W.H. Goodwin Embalmed the first person in Clinton County and was the first licensed embalmer in Frankfort. A graduate of Frankfort High School and a member of the Purdue University class of 1891-92, J.C. Goodwin had been continuously identified with the Goodwin Undertaking Company for 36 years. He was one of the best known and most efficient morticians in the state and was a leader in the state organization of morticians. It was in 1856, five years previous to the Civil War that Mr. George William Goodwin founded our mortuary. It now holds the distinction of being one of the oldest in Indiana. He came to Frankfort, then a struggling crossoads town, in 1852 from Lafayette, IN. He worked as a carpenter and cabinet maker and in 1856 founded Frankfort and Clinton County’s first furniture and casket company. In addition to his undertaking interests, Mr. Goodwin was also a Methodist minister and a Justice of the Peace.